Multiple threads and double needles can be one of the most confusing things in sewing. 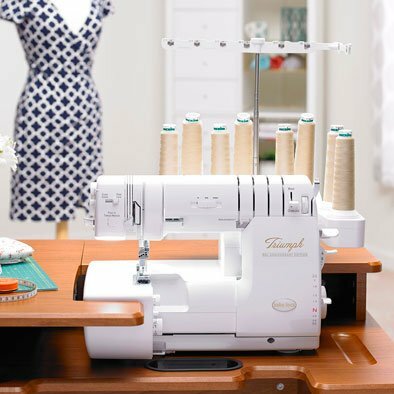 Many of us have purchased or thought about purchasing a serger but upon taking it out of the box or staring at it in the store we decide to leave it right there. Well, this class is where we change all of that! We will demystify the serger and explore all of the features and capabilities of this amazing machine. In this class, you will learn how to thread your serger, identify tension problems, clean/maintain your serger and create several of the most commonly used serger stitches, including a standard 4-thread overlock, a 3-thread overlock, a rolled hem and more! You will leave class with samples of the various stitches, including notes on machine and tension settings for each one. Put them in a binder for future reference! You must bring your own serger, including the owners manual. If your serger has not been used in several months, you should have it professionally serviced before class. Please be sure to reference the supply list below so that you bring all necessary supplies and accessories. Requirements: Ages 15+ You must bring your own serger, including the owners manual. If your serger has not been used in several months, you should have it professionally serviced before class. Please be sure to reference the supply list below so that you bring all necessary supplies and accessories.